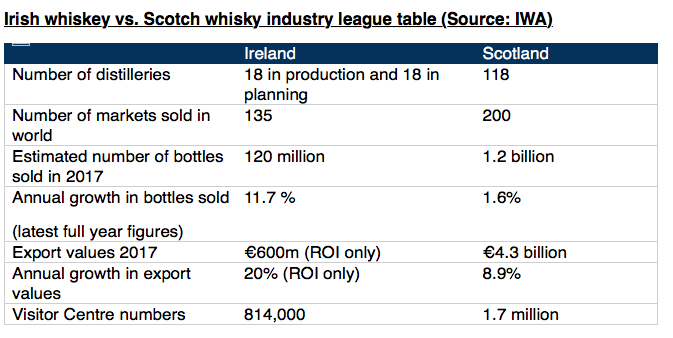 Newly released figures show that last year sales of Irish whiskey increased by 10.6% to 9.7 million and cases and bottle sales increased 11.7% to 120 million. Despite concerns over Brexit including the protection of GIs in Ireland, cross-border trading and the threat of US tariffs on Irish whiskey (the US is its largest market), the IWA says the boom in Irish whiskey is set to continue post-Brexit. Not only will Irish whiskey benefit from access to markets through the EU trade deals (as the EU’s CETA accord with Canada shows) - something Scotch whiskey will be excluded from - it will also debunk the powerful Scotch Whisky Association (SWA) from its lobbying role within the EU. William Lavelle, head of the IWA, told Harpers that the IWA has already commenced talks with France’s national Cognac bureau, BNIC, over the post-Brexit EU spirit industry scenario. With 18 distilleries in production and 18 in planning in Ireland, the Irish whiskey renaissance features several small start-ups craft producers who may push for changes to EU spirits legislation, once the Irish whiskey becomes the leading whiskey category in the EU. Whiskey bonder (a cask whiskey ageing company, reviving an Irish tradition) Chapel Gate earlier this year called on EU legislation to be modified to allow for greater transparency across the blended whiskey market. “A balance will need to be struck between innovation and any restrictive practices, once the IWA takes up the mantle from the SWA,” said Gary McLoughlin, co-founder of the Glendalough Distillery in Wicklow. Glendalough’s 7-year-old single malt Black Pitts Porter Finish whiskey and its seasonal gins and Wild Blackberry and Mountain Heather (which are to be exclusively sold by Selfridges) are among the drinks that will feature in Selfridges’ Irish month show at the end of August.